I know volumes have been written on this topic, but each time I work with teachers in this organization–whether it’s blended teachers or cohort teachers, this idea moves to the forefront, so it must need saying again. How can we shift our thinking so as to embrace the barriers in education, and search for opportunities to further our goals? 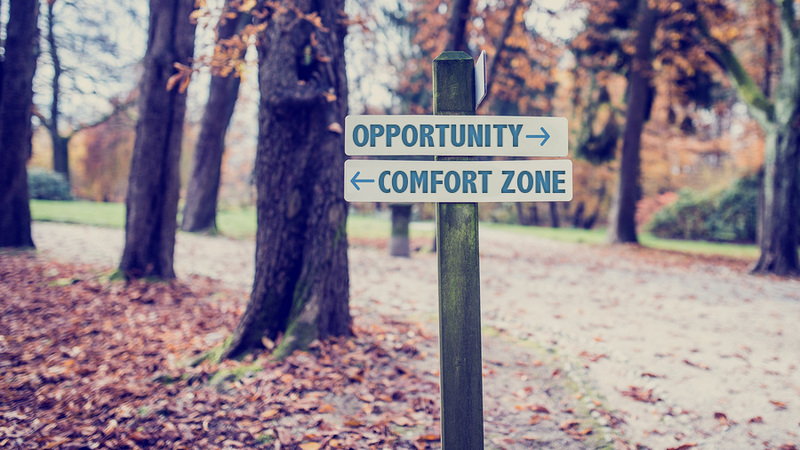 Experiencing change can cause us discomfort; it’s human nature to avoid things that make us uncomfortable, but if we can see our way past the barriers, there is a whole world of experiences just waiting for us. While I completely understand the purpose fear serves biologically (i.e. Danger, Will Robinson! ), I watch in fascination as teachers move ahead by leaps and bounds because they just aren’t afraid of failing. Case in point: I had the privilege of spending yesterday with a teacher from the Potlatch school district (Go, Loggers) and in that conversation, I was humbled by this man’s willingness to let nothing stand in the way of his professional growth or better serving his students. He told stories of his time in a 1:1 class, where he embraced his students’ knowledge, and felt supported by his administrators. In his current position, he’s encouraged to try new tools, and is supported as he pursues professional learning opportunities. He was willing to make mistakes; when he made one, he didn’t apologize, or feel embarrassed. He used it as a way to correct course, and move forward. He didn’t express concern over whether this new approach would work; he had a clear vision of how education could look, and he embraced it. The whole experience was an inspiring reminder of how I should face all my challenges. We spent conversation time on how fun it was to let students teach us. He gave examples of asking his kids to help him learn a tech tool; he willingly admitted to them he didn’t know everything. Gasp. Whoever put that notion in our pedagogy for the last 100 years should be flogged, by the way. He modeled so perfectly the process that’s necessary for learning; fear and ego will never get in the way of this man’s teaching. I also watched in fascination as he literally tackled a whole new learning management system without the slightest amount of fear or hesitation. I honestly can’t remember hearing him say the words can’t, won’t, or don’t. He could see the bigger picture: he gave himself permission to not get everything right the first time; he willingly engages with his students and his peers to “dig in”; he apparently refuses to be deterred by fear and uncertainty. I happened to see his principal on my way home; on the side of the road, with gesturing and widened eyes and smiles, I gushed that not only did I wish I could clone him, but I wanted to be just like him. How would education look if everyone felt like that? 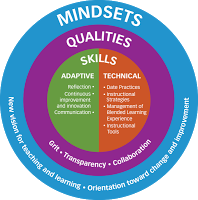 iNACOL’S Blended Teacher Competency Framework has four domains: Mindset, Qualities, Adaptive Skills and Technical Skills. In the Adaptive Skills domain, the first competency is Reflection. So, let’s reflect on reflecting. According to the CSU Writing Studio, “reflection transforms experience into genuine learning about individual values and goals and about larger social issues” and the same holds true for reflecting on one’s teaching. What happens when we put pen to paper, or font to page, as with the use of digital tools? What flows from us might very well be the barrier that’s keeping us from moving forward in our teaching practice. The thought of change can be a barrier in itself, but writing about what went well, what went poorly, what contributed to those experiences–can break down that barrier. Writing about anything can be cathartic, and let’s face it: at the end of a long teaching day, when we’ve given everything of ourselves and then some, catharsis can be a wonderful thing. 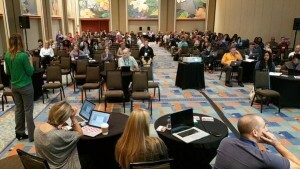 Some digital tools for journaling include Google docs, Padlet, DayOne app or just plain paper and pencil. The handy thing about a digital tool is that it’s on your phone or your device, and there’s no need to pack extra items. Regardless of how you do it, I encourage you to make a commitment, set aside some time, and write about your teaching. A world of growth awaits.